Pepco and Exelon are trying a last-ditch effort to get their $6.8 billion merger approved. Monday, the companies formally asked the D.C. Public Service Commission to reconsider conditions it put on the merger last month, warning that failure to reconsider could "derail" the merger. Chicago-based Exelon also said it will give the D.C. Public Service Commission $20 million it can use for customer discounts, to help low-income customers or to modernize the grid. 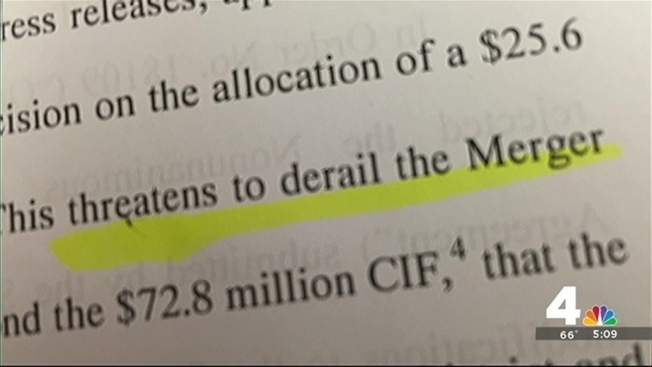 That's on top of the $25.6 million Exelon has previously to agreed to pay for customer discounts. Exelon and D.C.-based Pepco asked the commission to make a decision by April 7. The merger has been sought after by business groups, who believe a larger utility will be better managed and more reliable. But some city leaders and civic groups remain opposed to the merger, concerned about the possibility of higher rates set by a large, out-of-state corporation. "We can just say no to this merger, and Pepco almost certainly will do well on its own," said D.C. resident Larry Werner, testifying at the PSC. "It's still a bad deal," said Elissa Silverman, at-large District councilmember. "It started as a bad deal, it remains a bad deal." The District of Columbia Public Service Commission is the last regulator needed to clinch the deal. The Federal Energy Regulatory Commission and commissions in four states – Virginia, Maryland, Delaware and New Jersey – already have approved it.